Chemokine processing by proteases is emerging as an important regulatory mechanism of leukocyte functions and possibly also of cancer progression. We screened a large panel of chemokines for degradation by cathepsins B and D, two proteases involved in tumor progression. Among the few substrates processed by both proteases, we focused on CCL20, the unique chemokine ligand of CCR6 that is expressed on immature dendritic cells and subtypes of memory lymphocytes. Analysis of the cleavage sites demonstrate that cathepsin B specifically cleaves off four C-terminally located amino acids and generates a CCL201–66 isoform with full functional activity. 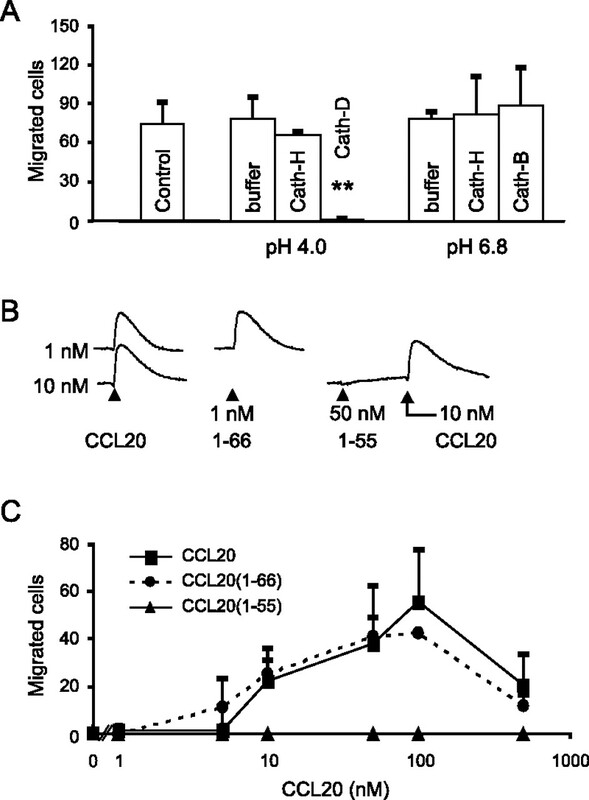 By contrast, cathepsin D totally inactivates the chemotactic potency of CCL20 by generating CCL201–55, CCL201–52, and a 12-aa C-terminal peptide CCL2059–70. Proteolytic cleavage of CCL20 occurs also with chemokine bound to glycosaminoglycans. In addition, we characterized human melanoma cells as a novel CCL20 source and as cathepsin producers. CCL20 production was up-regulated by IL-1α and TNF-α in all cell lines tested, and in human metastatic melanoma cells. Whereas cathepsin D is secreted in the extracellular milieu, cathepsin B activity is confined to cytosol and cellular membranes. Our studies suggest that CCL20 processing in the extracellular environment of melanoma cells is exclusively mediated by cathepsin D. Thus, we propose a model where cathepsin D inactivates CCL20 and possibly prevents the establishment of an effective antitumoral immune response in melanomas. Chemokines contribute to a variety of immunoregulatory and proinflammatory responses by control of leukocyte recruitment during inflammation (1, 2, 3). Beyond this primary function, chemokines also affect angiogenesis, angiostatic regulation mechanisms, hemopoiesis, lymphatic organogenesis, and, through the migration of cancer cells expressing chemokine receptors to chemokine-secreting organs, tumor metastasis (3, 4). Recently, several chemokines were described to possess also antimicrobial activities (5). Chemokine activity is modulated by several cytokines that directly or indirectly regulate chemokine expression and/or expression of their receptors (1). An increasing body of evidence suggests that chemokine clearing by proteases may also strongly affect their activity (1). In this context, a specific role was recently suggested for cathepsins that cleave and inactivate CXCL12/stromal cell-derived factor-1α (6) and CCL3/MIP-1α, CCL4/MIP-1β and CCL21/SLC (7). Conversely, the activity of CXCL5/epithelial cell-derived neutrophil-activating protein-78 (8) and CXCL8/IL-8 (9, 10), and CXCL7/neutrophil-activating peptide 2 (11) is potentiated upon interaction with cathepsins. This work builds on initial studies on the effects of proteases and chemokines showing that matrix metalloproteases (MMPs)3 and also dipeptidylpeptidase IV/CD26 are potent modifiers of chemokine function in addition to their roles in inflammation and wound healing (1). MMP activity activates the CXCR2 murine chemokine CXCL5/LIX in vitro and in vivo (12), inactivates CXCL12 (13, 14), and generates antagonists from all MCP chemokines (15). A causal link between chemokine function and organ trophism in breast cancer was shown for CXCR4 and its cognate ligand CXCL12 (16). Thus, the interrelationship between chemokines and members of the cathepsin family, such as cathepsin D (Cath-D) and cathepsin B (Cath-B), may play an important role in tumor biology. Indeed, both cathepsins not only facilitate tumor progression (17) but may have a prognostic value in patients with breast cancer (17, 18) and malignant melanoma (19). We therefore reasoned that the generation of an antitumoral immune response or cancer cell motility may be modulated by Cath-D and Cath-B generated by the tumor or reactive stroma. Among the novel substrates identified, we focused on CCL20 (also known as liver and activation-regulated chemokine (LARC); MIP-3α or exodus-1), which is a 9-kDa CC-type chemokine expressed constitutively in lung and liver (20), in keratinocytes in the epidermal layer of the skin (21), and in the intestinal mucosa (22, 23, 24). Several arguments indicate CCL20 as a potential important player in the chemokine network. First, CCL20 is the unique chemokine ligand of CCR6 and does not show the promiscuity of receptor binding characteristic of other chemokines (25, 26). Second, CCL20 not only triggers an innate immune response through the attraction of NK cells (27) but is also involved in adaptative immune responses, primarily by attracting immature dendritic cells, allowing them to take up foreign Ags and to mature (28, 29), and by attracting memory T and memory B cells to the site of inflammation (20, 30, 31). Furthermore, CCL20 has antimicrobial activities, similarly to defensins, which also bind to CCR6, and can therefore contribute to direct antimicrobial defenses (5). Lastly, CCL20 expression has been described in several leukemia/lymphoma cell lines, and in a variety of human neoplasms, such as colorectal adenocarcinoma, lung carcinoma, and malignant glioma (32, 33). In this study, we demonstrate for the first time chemokines as substrates for Cath-B, and we characterize the processing of CCL20 by Cath-D and Cath-B. We further demonstrate that cleavage of CCL20 by these proteases is retained when the chemokine is bound to extracellular matrix proteins, and we characterized in functional assays the activity of degradation products. Using human malignant melanoma as a model, we propose that neoplastic cells potentially exert autocrine regulatory mechanisms in the context of chemokine-protease interactions by modulating the migratory activities of CCL20 toward responsive cells of the antitumoral immune response. Cath-B, Cath-D, cathepsin H (Cath-H), and antisera to human Cath-B or Cath-D were obtained from Athens Research and Technology. Biotinylated goat anti-human CCL20 was from R&D Systems. IL-1α, IL-1β, and TNF-α were obtained from PeproTech. Synthetic chemokines were prepared as described previously (34). CCL2059–70 was prepared by C. Servis (Protein and Peptide Chemistry Facility, University of Lausanne, Switzerland). Pasteurized human plasma protein was provided by ZLB Bioplasma. Chondroitin sulfate (CS), other glycosaminoglycan (GAG) components, benzoylxycarbonyl (Z)-Arg-Arg-AMC hydrochloride (substrate for Cath-B), leupeptin and pepstatin A were purchased from Sigma-Aldrich. d-F-S(benzoyl)-F-F-A-A-pAB (substrate for Cath-D) was from Bachem. CA-074, a specific inhibitor for Cath-B, was obtained from Serva. Aminopeptidase M was from Roche Applied Science. Human melanoma cell lines A375 (solid tumor metastatic line; ATCC CRL-1619), A2058 (lymph node metastatic line; ATCC CRL-11147), and SK-MEL-2 (skin metastatic line; ATCC HTB-68) were from American Type Culture Collection. Escherichia coli BL21 was obtained from S. Didichenko (Institute of Immunology, Bern, Switzerland). Five micromolar chemokines were incubated with 50 ng of Cath-D or Cath-B for 90 min at 37°C in 50 μl of buffer I (50 mM sodium citrate, 50 mM NaCl; pH 4.0) or buffer II (PBS containing 4 mM EDTA and 2 mM l-cysteine; pH 6.8), respectively. In control experiments, protease inhibitors were preincubated with the enzyme for 3 min at 37°C. Reactions were stopped by heating to 90°C, and the chemokine cleavage products were separated by SDS-PAGE in 10–20% Tris-Tricine gradient polyacrylamide gels and stained with Coomassie blue. For cleavage site determination, the proteolytic fragments were acidified with trifluoroacetic acid and then loaded onto a reversed-phase C2/C18 column (Amersham Biosciences). Peptides were eluted with a linear gradient of 0–80% acetonitrile in 0.1% trifluoroacetic acid. The molecular masses were determined by MALDI-TOF mass spectrometry using a Voyager-DE STR system. The cleaved scissile bonds were then confirmed by Edman N-terminal sequencing. Ninety-six-well enzyme immunoassay/radioimmunoassay (EIA/RIA) plates (Costar) were coated overnight at 4°C with different concentrations of GAG. The wells were washed with PBS containing 1 mM CaCl2 and 1 mM MgCl2 (PBS+), and then blocked with 5% FCS for 2 h at room temperature. CCL20 in PBS containing 1% FCS was added and incubated for 2 h. After washing, the wells were treated with biotinylated goat anti-human CCL20 (0.55 μg/ml) in PBS+ containing 1% FCS and 0.05% Tween 20 for 1 h, followed by incubation with streptavidin-conjugated alkaline phosphatase (Promega, Catalys AG). To quantify the reaction, Blue Phos (Kirkegaard Perry Laboratories Bioreba) was added, and the OD595 was read in a microtiter plate reader. To determine the effect of Cath-D or Cath-B on chemokines bound to GAG, the wells were coated with GAG, washed as described above, and then blocked with 5% BSA. CCL20 in PBS+ containing 0.05% Tween 20 and 1% BSA was added to the GAG-coated wells and incubated for 2 h. After washing, the wells were incubated overnight at 37°C with 0.25 μg/ml Cath-D or Cath-B, and washed again, and CCL20 was probed with biotinylated goat anti-human CCL20. Bound CCL20 was then measured using streptavidin-conjugated alkaline phosphatase and Blue Phos as described above. [Ca2+]i changes were measured in CCR6-expressing mouse 300-19 pre-B cells (35) loaded with 0.1 nmol of fura 2-AM per 106 cells as described previously (36). Chemotaxis was assayed in 48-well chambers (Neuro Probe) using 3-μm pore size polycarbonate filters (Osmonics). Briefly, chemokines in chemotaxis buffer (RPMI 1640, 20 mM HEPES (pH 7.2), containing 1% pasteurized human plasma protein) were added to the lower wells, and 105 cells were resuspended in the same buffer to the upper wells and incubated for 90 min at 37°C. Cells migrating to the lower side of the filter were stained and counted in five high-power fields. Cells migrating into the lower wells were also counted. Studies were performed at least three times with triplicate wells per experiment. To measure the effect of Cath-D on the activity of immobilized CCL20, the polycarbonate filters were first coated for 75 min at 37°C with 50 nM CCL20 in 50 mM sodium citrate, 50 mM NaCl (pH 4.0), and then incubated overnight with 0.1–1 μg/ml Cath-D or Cath-H as control. The filters were washed with PBS, air-dried for 30 min, and rehydrated for 20 min in fresh chemotaxis buffer. Then, the filters were mounted into the chemotaxis chamber as indicated above and 105 cells were added to the upper wells. The lower chamber contained chemotaxis buffer with no chemoattractant. Chemotaxis was then performed as indicated above. To measure bactericidal activities, ∼1 × 104 exponentially growing E. coli BL21 cells were incubated with different concentrations of synthetic CCL20 or CCL2059–70 in 100 μl of 10 mM potassium phosphate buffer (pH 7.4) supplemented with 1% (v/v) Luria broth medium. The mixture was incubated for 3 h at 37°C (250 rpm), diluted in previous buffer, and plated on Luria broth agar plates as described previously (5). Surviving bacteria were quantitated as CFU/milliliter on plates after incubation at 33°C for 14 h. Bactericidal activity was expressed as the ratio of colonies counted to the number of colonies on a control plate (with no peptide). The LD90 is the concentration of protein that reduces the number of colonies by 90%. All results represent mean values of duplicates from at least three independent experiments. The three patients included in this study had histologically confirmed malignant melanoma with skin metastases removed by surgery. The protocol was approved by the Medical Ethics Committee of the Canton of Bern, Switzerland. All three patients signed informed consent before study entry. Melanoma cell lines were seeded into 100 × 20-mm tissue culture plates (Sarstedt) and fed with fresh culture medium (DMEM supplemented with 15% FCS; Invitrogen) every 2–3 days until 80% confluence. After aspiration of culture medium followed by washing with PBS, cells were supplied with 6.5 ml of DMEM containing 10% FCS and treated for 1–3 days with IL-1α and TNF-α. When secreted chemokines were further purified, cells were stimulated with DMEM containing the proinflammatory cytokines and 2% FCS. Skin metastases were surgically removed from melanoma patients. After removing adipose and fibrous tissue, the metastasis were cut into small pieces and single-cell suspension was prepared by carefully disrupting the tissue pieces between the frosted ends of two microscope slides. Contaminating lymphocytes and macrophages/monocytes were removed by incubating the cell suspension with purified monoclonal mouse anti-CD3 and anti-CD14 Ab (BD Pharmingen) as first-stage reagent and sheep anti-mouse IgG-coated Dynabeads (Dynal Biotech) as second-stage reagent. Depletion was performed according to the manufacturer’s indication. Contamination of the final melanoma cell preparation by CD3- and CD14-positive cells varied from 0.5 to 12% as assessed by FACScan analysis. Melanoma cells adhered overnight in a 6-well plate (Costar 3506) at a concentration of 1–2 × 106/well in 15% FCS. Adherent and suspended cells were stimulated for 48 h with 2 ml DMEM/10% FCS containing IL-1α and TNF-α. A375, A2058, and SK-MEL-2 cells were grown for 24, 48, and 72 h as described above. CCL20 was measured in the conditioned medium by a sandwich-type ELISA using commercially available kit (R&D Systems). The detection range was typically between 20 pg/ml and 1 ng/ml. Supernatants were centrifuged for 20 min at 1800 × g and then passed through a 0.22-μm filter before applying to a 1-ml HiTrap heparin column (Amersham Biosciences) equilibrated with 40 mM KHPO4, 20 mM NaCl, 1 mM EDTA, 1 M urea, and 5% glycerol (pH 7.2). Proteins were eluted stepwise with 0.2, 0.5, and 1 M NaCl. CCL20-containing fractions were identified by ELISA and further purified on a reversed-phase C2/C18 column (Amersham Biosciences) with a flow rate of 0.1 ml/min and a continuous gradient of 0–80% acetonitrile in 0.1% trifluoroacetic acid. CCL20-containing fractions were used for cell migration and Ca2+-releasing experiments. Cells at 80% confluence were washed with PBS and then detached from the culture dish with trypsin. For the isolation of membranes, cells were centrifuged for 5 min at 180 × g, washed with PBS, and resuspended in 2 ml of ice-cold hypotonic buffer containing 10 mM Tris-HCl and 0.5 mM MgCl2 (pH 7.6). After sonication, 0.25 vol of 10 mM Tris-HCl, 0.5 mM MgCl2, and 0.6 M NaCl (pH 7.6) was added to restore tonicity. Cell debris and nuclei were removed by centrifugation at 560 × g; the supernatant was adjusted to 5 mM EDTA and centrifuged at 150,000 × g. The membrane pellet was resuspended in 100 μl of PBS and stored at −20°C until used for CCL20 processing or Cath-B and Cath-D activity assays. Protein concentration was determined by the bicinchoninic acid assay (Pierce). Cath-D activity was determined in cells and cellular fractions using a variation of the method described by Heylen et al. (37). Briefly, the Cath-D substrate d-F-S(benzoyl)-F-F-A-A-pAB (1.4 mM) was incubated for 4 h at 37°C with membranes or cytosol (25-μg protein equivalent) or conditioned medium (30 μl) in 0.1 M sodium citrate buffer (pH 4.0). This step was followed by incubation for 2 h at 37°C with aminopeptidase M (7 μg/ml). The reaction was stopped by adding TCA (14% v/v final). Released 4-aminobenzoic acid (pAB) was measured at 546 nm. The activity of Cath-D is expressed as picomoles of pAB produced per minute per 105 cells. Cath-D specificity was confirmed using, in parallel assays, 2 μM pepstatin A, an inhibitor of aspartic proteases. Cath-B activity in cells and cellular fractions was determined as described previously (38). Shortly, cells were first washed with PBS, and 0.5 × 106 cells were then transferred to 96-well plates and resuspended in PBS containing 4 mM EDTA and 2 mM l-cysteine (pH 6.8). Alternatively, 15 μg of membrane proteins or 200 μg of cytosolic protein or 200 μl of conditioned medium were used. The assay was initiated by the addition of 100 μM Z-Arg-Arg-AMC (Cath-B substrate) in the absence or presence of 1 μM CA-074 and followed for 50 min in a fluorescence plate reader with an excitation wavelength of 355 nm and an emission wavelength of 460 nm. To measure intracellular Cath-B activity, assay buffer was supplemented with 0.1% Triton X-100. Activity inhibited by CA-074 was considered to represent Cath-B activity. The activity of Cath-B is expressed as picomoles of 7-amino-4-methylcoumarin (AMC) produced per minute per 105 cells. A standard curve of free AMC or pAB was used for quantification. Proteins were resolved by SDS-PAGE (12 or 10–20% gradient polyacrylamide) and electroblotted onto polyvinylidene difluoride membranes. CCL20 was detected using polyclonal goat anti-human CCL20 (180 ng/ml), and Cath-B and Cath-D were detected with polyclonal rabbit anti-human Cath-B or Cath-D (1:5000) Ab. Formalin-fixed, paraffin-embedded tissue samples were cut at 2–3 μm, dewaxed, rehydrated, and incubated with a polyclonal rabbit-anti-Cath-D Ab (DakoCytomation) in TBS containing 0.5% casein and 5% normal goat serum, for 60 min at room temperature. Sections were then washed with TBS. Next, a 1/500 dilution of biotinylated goat-anti-rabbit Ig antiserum (DakoCytomation) was applied for 45 min. The primary Ab was omitted in control sections. Thereafter, the sections were incubated with streptavidin-conjugated alkaline phosphatase (DakoCytomation). Staining was developed with fuchsin-naphthol AS-BI (Sigma-Aldrich) for 30 min, and counterstaining was performed with hematoxylin. Total RNA from cultured melanoma cells was extracted with RNeasy Midi kit (Qiagen) according to the manufacturer’s instructions. After treatment with RNase-free DNase, total RNA (1 μg) was reverse transcribed using oligo(dT)17 primer and AMV reverse transcriptase (Promega). Resulting first-strand DNA was amplified in a final volume of 20 μl containing 10 pmol of each primer and 1 U of Taq polymerase (Promega). The primers used were the following: +5′-accatgtgctgtaccaagagtttg-3′ and −5′-ctaaaccctccatgatgtgcaagtga-3′ for human CCL20; +5′-gtcaacggatttggtcgtatt-3′ and −5′-agtcttctgggtggcagtgat-3′ for human G3PDH. Amplification conditions were denaturation at 94°C for 30 s (5 min for the first cycle), annealing at 60°C for 30 s, and extension at 72°C for 30 s (5 min for the last cycle) for 35 cycles, and 27 cycles for human G3PDH. Amplification products (10 μl each) were subjected to electrophoresis on 2% agarose and stained with ethidium bromide. Formaldehyde-fixed and paraffin-embedded melanoma tissues from 10 patients were retrieved from the archives of the Institute of Pathology, University of Bern (Bern, Switzerland). The human CCL20 cDNA in pBluescriptII KS vector was a gift from B. Moser (University of Bern). Digoxigenin-labeled riboprobes (Roche Applied Science) for CCL20 were transcribed in vitro from linearized, gel-purified plasmids using T7 polymerase (antisense cRNA probe) and T3 polymerase (sense cRNA probe). In situ hybridization was performed as previously described (39), except that sections were prehybridized (30 min, 50°C) and hybridized (overnight, 50°C) in DIG Easy Rib (Roche Applied Science), and washed at 55°C in 2× SSC, 1× SSC, and 0.1× SSC. All results represent mean values of triplicates. Values of p were calculated by Student’s t test using Microsoft Excel software. Correlation coefficients were calculated by linear regression analysis. A value of p < 0.05 was considered statistically significant. We tested a panel of 24 chemokines as potential substrates for Cath-D and Cath-B (Table I⇓). In addition to the previously reported processing of CCL3, CCL4, and CCL21 (7), we now describe CCL20 and CCL27 as additional substrates for Cath-D. None of the CXC chemokines was processed by Cath-D. In addition to Cath-D, overexpression of Cath-B has also been associated with poor prognosis in cancer. We tested therefore whether chemokines might also be substrates for this protease. We found that Cath-B, when measured at pH 6.8, cleaved a large spectrum of chemokines, including all non-ELR CXC chemokines (lacking Glu-Leu-Arg sequence preceding the first cysteine) and 6 of the 14 analyzed members of the CC family. CCL20, CCL21, and CCL27 were the only chemokines that were cleaved by both proteases. Time courses of CCL20 processing by Cath-D and Cath-B are presented in Fig. 1⇓A. Cleavage by both proteases led to stable products that were not further degraded after an incubation time of 6 h and 90 min, respectively. Cleavage of CCL20 by Cath-D occurred at different sites, and five fragments were isolated by reversed-phase C2/C18 column chromatography (Fig. 1⇓B). Analysis of these peptides by mass spectroscopy and N-terminal sequencing led to the identification of three N-terminal peptides, CCL201–19, CCL201–52, and CCL201–55, an internal peptide, CCL2023–55, a C-terminal peptide of 12 aa, CCL2059–70 and full-length CCL20. CCL201–19 and CCL2023–55 were held together by disulfides as demonstrated by MALDI analysis of this column fraction after reducing with DTT. Cleavage by Cath-B was very rapid and also complete and generated the distinct cleavage product CCL201–66 (Fig. 1⇓, B and C). CCL20 processing by Cath-D and Cath-B. A, Time course of CCL20 processing by Cath-D and Cath-B. CCL20 (5 μM) was incubated with 50 ng of Cath-D or Cath-B at 37°C for the indicated times in buffer I (pH 4.0) or buffer II (pH 6.8), respectively. Pepstatin A (2 μM) or CA-074 (5 μM) were used as inhibitors for Cath-D and Cath-B, respectively (I). The cleavage products were separated by SDS-PAGE and stained with Coomassie blue. B, Reverse phase-HPLC profile of the cleavage products of CCL20 after Cath-D and Cath-B processing. C, CCL20 cleavage sites for Cath-D and Cath-B. The positions of the amino acids located at the cleavage sites are indicated. The degradation products of CCL20 were functionally tested by cell migration and intracellular calcium mobilization experiments. After incubation with Cath-D, CCL20 did not attract CCR6-transfected pre-B mouse cells. By contrast, exposure to Cath-B had no influence on the chemotactic activity of CCL20 (Fig. 2⇓A). Migration experiments were also performed in the presence of Cath-H, a protease that does not cleave CCL20. As expected, there were no significant differences between experiments with control buffer and buffer containing Cath-H (data not shown). We next tested the activity of the purified fragments resulting from Cath-D cleavage, CCL201–55 and CCL201–52. CCL201–55 was entirely inactive and could neither mobilize intracellular Ca2+ (Fig. 2⇓B) nor induce cell migration (C). Furthermore, we could demonstrate that CCL201–55 does not block the receptor or act as an antagonist, because subsequent addition of intact CCL20 yields a full Ca2+ response (Fig. 2⇓B, right trace). The shorter peptide CCL201–52 was inactive as well (data not shown). By contrast, the product of Cath-B cleavage, CCL201–66 retained full activity, mobilized intracellular Ca2+ (Fig. 2⇓B) and induced cell migration with similar potency as full-length CCL20 (Fig. 2⇓C). Overall, the above results show that Cath-D inactivates CCL20, whereas removal of four C-terminal amino acids by Cath-B has no functional consequences on CCL20 indicating that the extreme C-terminal part of this chemokine is not essential for proper CCR6 activation. We also assessed whether cleaved CCL20 might use an alternative receptor than CCR6. 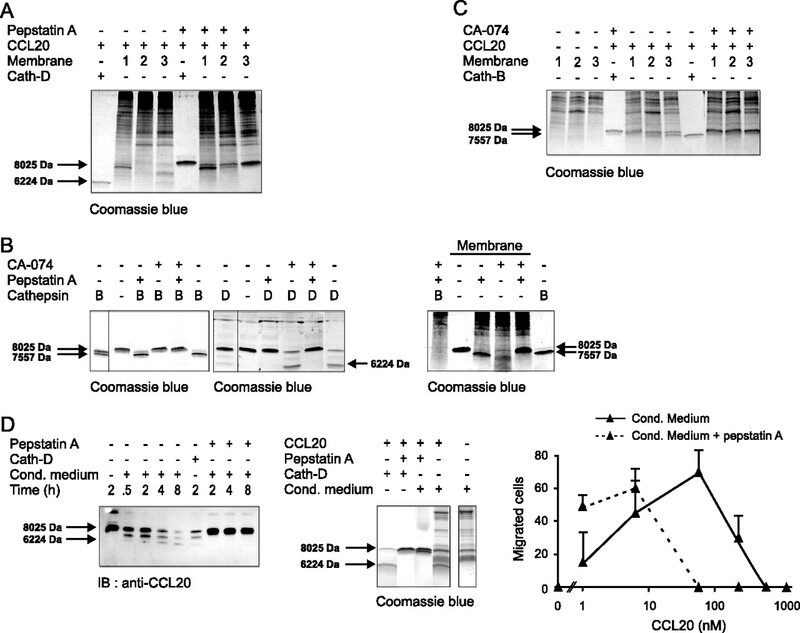 Transfected murine cells expressing CXCR2, CXCR3, CXCR4, CCR1, CCR5, and CCR7 were incubated with the cleavage products, CCL201–55 and CCL201–66, as well as intact CCL20 and monitored for calcium-releasing activity. None of these receptors responded to CCL20 or to its truncated products. Influence of cathepsin treatment on chemotactic and calcium mobilization activity of CCL20. A, Migration of CCR6-transfected cells in response to CCL20 (control) and CCL20 after incubation for 90 min with buffer I (pH 4.0) and Cath-D or Cath-H, or with buffer II (pH 6.8) and Cath-B or Cath-H. Results are expressed as means ± SD of the numbers of cells observed per five high-power fields. No migrated cells were detected in the absence of chemoattractant. Statistically significant decreases in migrated cell number below the control values are indicated by asterisks (∗∗, p < 0.01). B, [Ca2+]i-dependent fluorescence changes in CCR6-transfected cells by CCL20, CCL201–66, and CCL201–55. C, Migration in response to increasing concentrations of CCL20, CCL201–55, and CCL201–66. Results are expressed as means ± SD of the numbers of cells observed per five high-power fields. It has been demonstrated that CCL20 has potent antimicrobial activity similar to β-defensins (40), which is ascribed to positive charges in the C-terminal part (5, 40). We therefore tested whether the C-terminal peptide CCL2059–70 generated by Cath-D cleavage maintains the bactericidal activity of intact CCL20. Using a standard colony-forming assay with E. coli BL21 bacteria, we could show that CCL2059–70 killed E. coli in a dose-dependent manner with a LD50 of 3.2 μg/ml, whereas a concentration of 0.53 μg/ml full-length CCL20 was able to kill 50% of bacteria (data not shown). The activity of CCL201–66, the fragment obtained after cleavage with Cath-B, was not significantly different from that of intact chemokine (data not shown). Chemokine activity is further regulated by binding to GAGs located on endothelial cells and extracellular matrix. GAGs immobilize and enhance local concentrations of CCL20, thereby generating a solid-phase haptotactic concentration gradient. To determine whether binding to GAG may protect CCL20 from proteolytic processing by Cath-D, we first established that GAG molecules like CS, bind CCL20. Our microwell binding assay showed that CCL20 bound to CS-A-coated wells in a dose-dependent manner, whereas this specific increase in binding was not observed for the control GAG chondroitin (Fig. 3⇓A). Incubation of GAG with Cath-D did not affect subsequent CCL20 binding (data not shown). When GAG-immobilized CCL20 was treated with 0.25 μg/ml Cath-D, the chemokine no longer reacted with the polyclonal CCL20 Ab, suggesting proteolysis. It should be noted that in ELISA or dot-blot assays, polyclonal CCL20 Ab were able to recognize the CCL20 cleavage products after Cath-B but not Cath-D exposure (data not shown). Conversely, treatment with Cath-B, which is known to also have exopeptidase activity at acidic pH (41), did not significantly affect the recognition of CCL20 by anti-CCL20 at acidic nor neutral pH (Fig. 3⇓B). This result suggests that the last four residues of CCL20 are not included in the epitopes of the Ab. Incubation of polycarbonate filters with 50 nM CCL20 created a haptotactic chemokine gradient, which was able to attract CCR6-transfected cells (Fig. 3⇓C). This gradient was destroyed when the CCL20-coated filters were incubated with 0.1 μg/ml Cath-D for 16 h. Conversely, incubation with Cath-H did not inhibit migration of the CCR6 cells (data not shown). We did not test the effect of Cath-B on the haptotactic gradient of CCL20, because CCL20 activity was not affected after cleavage with this protease. As expected, a haptotactic chemokine gradient of CCL201–66, the product of Cath-B processing, was able to attract CCR6-transfected cells, whereas CCL201–55, the product of Cath-D processing, was inactive (data not shown). Taken together, these experiments indicate that Cath-D processes not only soluble CCL20 but also CCL20 attached to GAGs, which is the mostly likely condition in vivo. GAG-bound CCL20 is cleaved by Cath-D. A, Binding of CCL20 to CS-A. EIA/RIA plate wells were coated with 20, 50, or 100 μg/ml CS-A, or chondroitin as control. After blocking, increasing concentrations of CCL20 (25, 50, 100, or 150 ng/ml) were added to the wells and incubated for 2 h. The binding of CCL20 to GAG was assessed by ELISA. Results are expressed as the mean of OD ± SD. Statistically significant increases above 25 ng/ml CCL20 concentration values are indicated by asterisks (∗, p < 0.05; ∗∗, p < 0.01; and ∗∗∗, p < 0.001). B, Cath-D treatment inhibits recognition of CCL20 by anti-CCL20 Ab. EIA/RIA plate wells were coated with 100 μg/ml CS-A. After blocking, 150 ng/ml CCL20 was added to the wells, incubated for 2 h, and washed before treating with Cath-D or Cath-B (0.25 μg/ml) for 16 h at 37°C. CCL20 was then assessed by ELISA. Controls with buffer only, are indicated. The values are expressed as the relative OD of binding to CS-A compared with nonspecific binding to BSA. Statistically significant decreases are indicated by an asterisk (∗, p < 0.05). C, Haptotactic assays with CCR6-transfected cells. Polycarbonate filters were coated with 50 nM CCL20 and then incubated overnight with 0.1 μg/ml Cath-D, buffer I, or migration buffer (control). Results are expressed as means ± SD of the numbers of cells observed per five high-power fields. No migrated cells were detected in the absence of chemoattractant. Statistically significant decreases in migrated cells compared with control are indicated by an asterisk (∗, p < 0.05). CCL20 is up-regulated in neoplastic human skin diseases, such as mycosis fungoides or under inflamed conditions, such as psoriasis and contact dermatitis (41, 42). So far, no expression of CCL20 in melanoma has been described; therefore, we investigated whether expression of this chemokine may also occur in human malignant melanoma cell lines and primary malignant melanoma of the skin. Total RNA was extracted from three melanoma cell lines, A375, A2058, and SK-MEL-2, from primary keratinocytes, the keratinocyte cell line NCTC 2544, and the epithelial cell line Caco-2, and subjected to RT-PCR analysis. Expression of CCL20 was evident in all cells (Fig. 4⇓A). Furthermore, CCL20 transcripts were also detected in paraffin-embedded sections of human malignant melanoma (Fig. 4⇓B). Keratinocytes of the epidermal layer served as internal positive control for CCL20 expression. CCL20 mRNA was detected in a small proportion of the melanoma cells of 6 of the 10 patients studied. 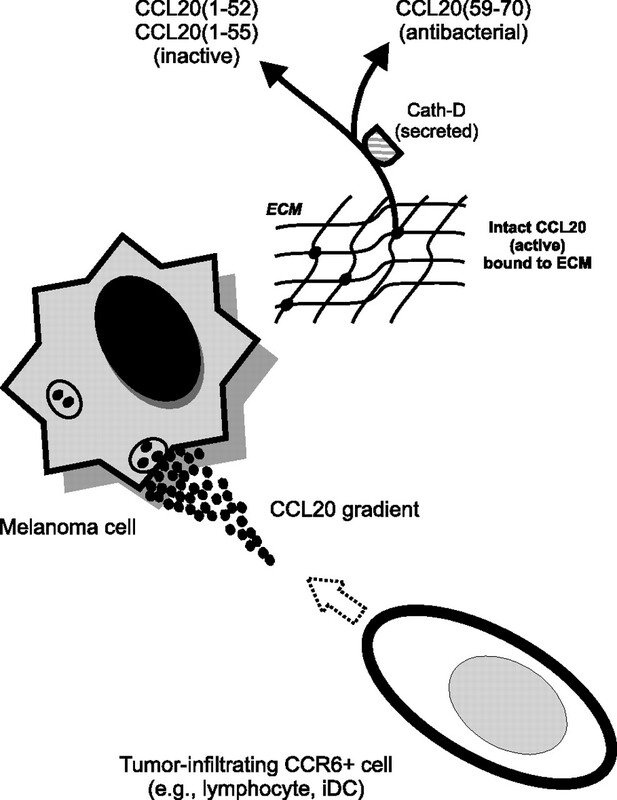 Not all melanoma cells expressed CCL20, possibly due to the existence of functionally different subsets. Based on morphology, the CCL20 transcripts did not appear to be related to the presence of accumulated leukocytes. Expression of CCL20 in melanoma cell lines and human malignant melanoma. A, RT-PCR analysis of CCL20 and G3PDH expression in melanoma cell lines A375, A2058, and SK-MEL-2. Positive control RT-PCR products were obtained from primary keratinocytes (Prim. Keratin. ), human keratinocyte cell line (NCTC 2544), and Caco-2 cells. A 100-base DNA ladder (ladder) and a negative control (no cDNA; control −) are shown. B, Localization of CCL20 transcripts in human malignant melanoma by in situ hybridization. 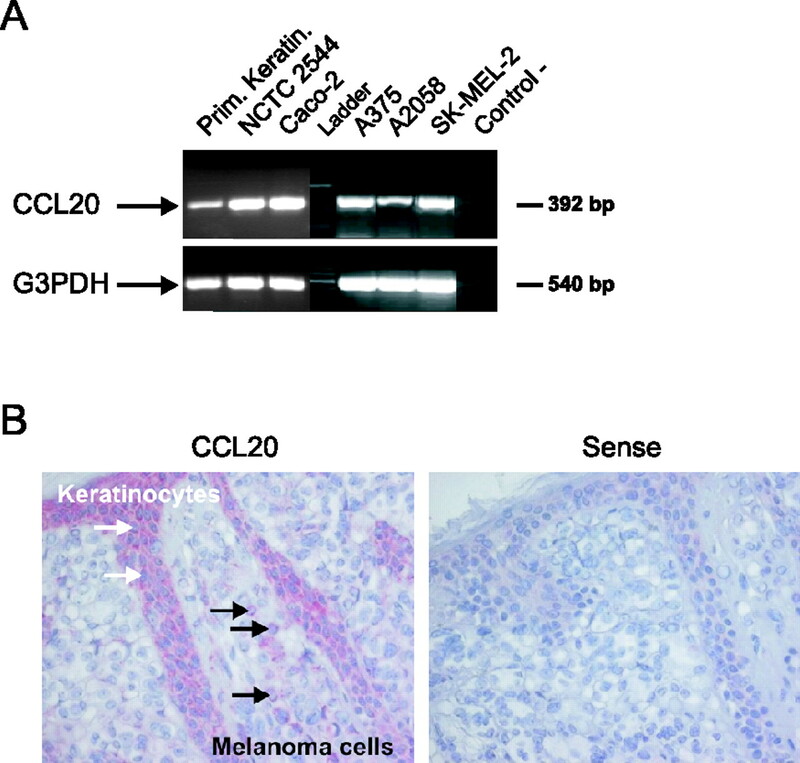 Hybridization signals of antisense CCL20 riboprobes are identified in keratinocytes and melanoma cells. No signals were detected in serial sections hybridized with the sense probe. To test whether CCL20 transcripts are translated into a functional protein, we analyzed CCL20 secretion of human melanoma cell lines and assessed its activity. Resting melanoma cells produced relatively low amounts of CCL20. However, treating the cells for 48 h with the proinflammatory cytokines IL-1α (10 ng/ml) and TNF-α (50 ng/ml) increased CCL20 levels 3- to 50-fold in all cell lines (Fig. 5⇓A). CCL20 from conditioned medium of stimulated A375 and SK-MEL-2 cells was partially purified using heparin affinity chromatography and reversed-phase HPLC and tested for biological activity. 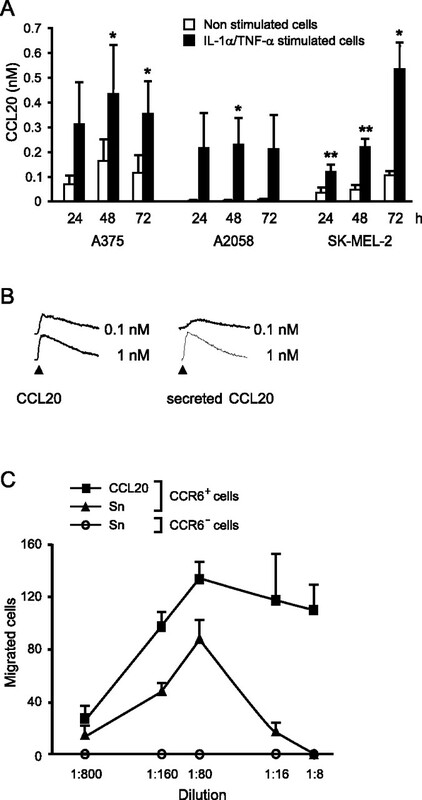 CCL20 secreted by melanoma cells mobilized intracellular Ca2+ (Fig. 5⇓B) and was also able to induce cell migration with similar potencies as synthetic CCL20 (Fig. 5⇓C). Interestingly, melanoma cell lines did not secrete the skin-specific chemokine, CCL27, even upon stimulation with IL-1α, TNF-α, and IL-1β either alone or in combination (data not shown). Secretion of active CCL20 by melanoma cell lines. A, CCL20 in culture supernatant of melanoma cell lines after stimulation with IL-1α and TNF-α. Confluent A375, A2058, and SK-MEL-2 melanoma cells were stimulated for 24, 48, or 72 h with 10 ng/ml IL-1α and 50 ng/ml TNF-α in culture supernatant supplemented with 10% FCS. Culture supernatant from unstimulated cells was used as control. Production of CCL20 was determined by ELISA. The results are the means ± SD of three experiments. Absence of error bar means that the error bar is within the symbol. Statistically significant increases in CCL20 production are indicated by asterisks (∗, p < 0.05; and ∗∗, p < 0.01). B, CCL20 from culture supernatant of stimulated A375 cells was partially purified by heparin-Sepharose column and reversed-phase chromatography. [Ca2+]i-releasing activity was analyzed with CCR6-transfected cells. C, CCL20 from culture supernatant of stimulated A375 cells was partially purified by heparin-Sepharose column. CCL20-containing fractions were 350-fold concentrated relative to culture supernatant (Sn) and analyzed for cell migration using CCR6-transfected cells (CCR6+; ▴). Nontransfected cells (CCR6−; ○) were used as negative control and synthetic CCL20 (80 nM) as positive control (CCR6+; ▪). Results of three experiments are expressed as means ± SD of the numbers of cells observed per five high-power fields. In a more physiological setting, we stimulated human metastatic melanoma cells for 48 h with IL-1α and TNF-α, and we observed CCL20 secretion up to 0.5 nM per one million cells. This findings suggest that melanoma cells may produce sufficient CCL20 to attract immune cells. To localize Cath-D and Cath-B activities with respect to the cellular compartment and the extracellular environment, we determined proteolytic activities of these enzymes in cellular membranes, cytosol, and conditioned medium of the melanoma cell lines A375, A2058, and SK-MEL-2 using d-F-S(benzoyl)-F-F-A-A-pAB as substrate for Cath-D and Z-Arg-Arg-AMC as substrate for Cath-B. Cath-D activity was detected in all compartments of SK-MEL-2 cells, and low activities were found in membranes of A2058 cells (p < 0.05) (Fig. 6⇓A). However no Cath-D activity was found in A375 cells. Immunoblots of membranes, cytosol, and conditioned medium with anti-Cath-D Ab were in line with these findings (Fig. 6⇓B). Coomassie blue staining demonstrated that equal amounts of proteins were loaded (Fig. 6⇓B). Cathepsins in melanoma cell lines and human malignant melanoma. A375, A2058, and SK-MEL-2 melanoma cells were stimulated with IL-1α and TNF-α for 48 h before isolation of subcellular fractions. A, Upper panel, Membranes, cytosol, and conditioned medium were incubated for 4 h with 30 mM d-F-S(benzoyl)-F-F-A-A-pAB to assess Cath-D activity. Results are expressed as picomoles of pAB released per minute per 105 cells. Cath-D activity was also measured in the presence of pepstatin A (data not shown). A, Lower panel, Intact cells, cells lysed with Triton X-100, membranes, and cytosol were incubated for 50 min with 100 μM Z-Arg-Arg-AMC to assess Cath-B activity. Results are expressed as nanomoles of AMC released per minute per 105 cells. No Cath-B activity was detected in conditioned medium or in the presence of CA-074 (data not shown). Statistically significant increases in activities above controls in the presence of inhibitor are indicated by asterisks (∗, p < 0.05; and ∗∗, p < 0.01). B, Membranes, cytosol, and conditioned medium of A375 (1), A2058 (2), and SK-MEL-2 (3) cells were immunoblotted with anti-Cath-D or anti-Cath-B Ab. Purified Cath-D and Cath-B from human liver were used as controls (Cathepsin). A Coomassie blue staining of similar samples is given as a control for equal loading of the samples. C, Cath-D was immunochemically detected in paraffin sections of human melanoma (left panel); the negative control was obtained by omitting the primary Ab (right panel). As expected, Cath-B activity of melanoma cells was mainly associated with membranes. However, activity was not detected at the cell surface but was associated with intracellular membranes, as demonstrated by experiments with intact and Triton X-100-permeabilized cells (Fig. 6⇑A). Immunoblots with anti-Cath-B Ab revealed that A375 membranes contained a Cath-B doublet at 25/27 kDa (nonglycosylated and glycosylated forms of the H chain protein, respectively). Only the upper band of this doublet was detected in A2058 membranes, whereas SK-MEL-2 cells displayed only the lower band. In addition, the SK-MEL-2 cells contained the 31-kDa isoform both in membranes and cytosol (Fig. 6⇑B). Because Cath-D was found to be secreted into the extracellular milieu of SK-MEL-2 cells and processing of CCL20 by this protease modified its activity, we investigated Cath-D expression in human melanoma tissue by immunohistochemical staining. As shown in Fig. 6⇑C, Cath-D immunostaining (red signals) is detected in cytoplasma of melanoma cells and probably also in the extracellular microenvironment of the tumor. The cells of the epidermis are negative. We then studied cleavage of exogenously added CCL20 by membranes and conditioned medium of three melanoma cell lines and compared it to the cleavage pattern where purified cathepsins were used. CCL20 was incubated with membranes or conditioned medium of IL-1α- and TNF-α-stimulated cells, and the cleavage products were separated by SDS-PAGE and stained with Coomassie blue. In the presence of Cath-D-specific buffer, the membranes from all melanoma cell lines processed CCL20, but cleavage was only partially inhibited by pepstatin A (Fig. 7⇓A), indicating the presence of non-pepstatin A-sensitive protease activity. Noticeably, pepstatin A had no influence of CCL20 processing by membranes of A375 cells, further confirming the results presented in Fig. 6⇑A, which demonstrate that these cells do not express Cath-D. We then tested whether the non-pepstatin A-sensitive protease activity would depend on Cath-B, which is known to have exopeptidase activity at acidic pH (Fig. 7⇓B, left panel). SK-MEL-2 membranes were incubated with CCL20 in the presence of CA-074 and/or pepstatin A. Results of Coomassie blue staining show that cleavage of CCL20 was totally blocked when both inhibitors were present (Fig. 7⇓B) and establish that Cath-D (and/or Cath-D-like proteases) and Cath-B are the only proteases involved in the processing of CCL20 at pH 4.0. Pepstatin A-sensitive proteases degraded CCL20 totally, whereas the cleavage by Cath-B was limited. Such limited proteolysis was also observed when membranes of A375, A2058, and SK-MEL-2 cells were incubated at neutral pH (Fig. 7⇓C). Because processing was inhibited by the specific Cath-B inhibitor CA-074, these results suggest Cath-B to be the only protease involved. 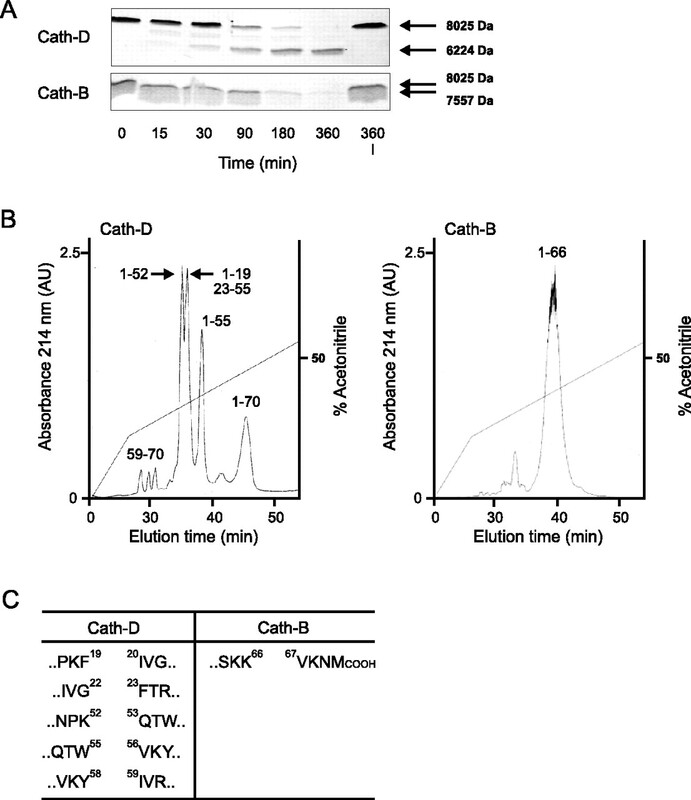 Conditioned medium of stimulated SK-MEL-2 cells processed CCL20 in a pepstatin A-dependent manner to the same truncation products as purified Cath-D (Fig. 7⇓D), which was verified by mass spectrometry. The migration experiment presented in Fig. 7⇓D, right panel, further supports the view that conditioned medium of melanoma cells inactivates CCL20. CCL20 was incubated for 8 h with conditioned medium of SK-MEL-2 cells in the presence and absence of pepstatin A, and aliquots were then used for migration experiments. In the presence of pepstatin A, no CCL20 degradation took place and only 5 nM was necessary to induce a maximal cell migration response; 50 nM, however, was necessary for a maximal response when incubation was performed in conditioned medium with active Cath-D. All of these results strongly point to Cath-D as the CCL20-inactivating protease in conditioned medium. Cleavage of CCL20 by melanoma cell lines. A, Processing of CCL20 by membranes of A375 (1), A2058 (2), and SK-MEL-2 (3) cells. CCL20 (5 μM) was incubated for 4 h at 37°C with membrane equivalents of 3 × 105 cells in 50 mM sodium citrate, 50 mM NaCl (pH 4.0), and pepstatin A as indicated. The cleavage products were separated by SDS-PAGE and stained with Coomassie blue. The molecular masses of intact CCL201–70 and CCL201–55 after Cath-D cleavage are 8025 and 6224 Da, respectively (arrows). B, Processing of CCL20 by purified Cath-B (left panel) or Cath-D (middle panel) for 1.5 h or membranes of SK-MEL-2 cells (right panel) for 4 h at pH 4.0 in presence of CA-074 and pepstatin A as indicated. The molecular masses of intact CCL201–70, CCL201–66 after Cath-B cleavage and CCL201–55 after Cath-D cleavage are 8025, 7552, and 6224 Da, respectively (arrows). C, As in A but incubation was with PBS containing 4 mM EDTA, 2 mM l-cysteine, 0.1% Triton X-100 (pH 6.8). D, Processing of CCL20 by conditioned medium of SK-MEL-2 cells. Conditioned medium was concentrated (2.5×) and incubated with CCL20 (5 μM) at pH 4.0 for the indicated times and in the presence of pepstatin A (left panel). Coomassie blue staining of CCL20 incubated for 8 h with purified Cath-D or conditioned medium is shown in the middle panel. The right panel shows migration in response to increasing concentrations of CCL20 after incubation for 8 h in conditioned medium with or without pepstatin A. Results are expressed as means ± SD of the numbers of cells observed per five high-power fields. A representative experiment of three is shown. IB, Immunoblotting; Cond. medium, conditioned medium. Chemokine processing by proteases is emerging as an important regulatory mechanism of chemokine functions apart from transcriptional regulation (43, 44) or modulation of chemokine receptor expression (45). Proteases involved in this process are mainly dipeptidylpeptidase IV/CD26, a serine-type protease, several MMPs, but also cathepsin G, elastase, urokinase plasminogen activator, and plasmin (1). We previously suggested that cathepsins may represent an additional family of proteolytic enzymes affecting the chemokine regulatory network (7). In this report, we identified new substrates among the chemokine family for Cath-D, and we characterized for the first time the processing in vitro of a large spectrum of chemokines by Cath-B. Both cathepsins are generally overexpressed in neoplastic tissues and have been previously extensively studied as possible prognostic factors in a variety of human cancers including breast cancer (46) and malignant melanoma (19, 47). In general, receptor binding and chemokine functionality are modulated by epitopes in the N-terminal region of chemokines (1). Accordingly, N-terminal truncation by proteases is an important step that may lead to decrease or increase of the chemotactic potency of chemokines (1). The present data and our previous studies (7), however, indicate that the proteolytic activity of Cath-D and Cath-B is preferentially restricted to the C terminus of chemokines. So far, processing of the C-terminal amino acids has been described for CXCL7 (48, 49), CCL21 (7), and CXCL10 (50). Notably, for some chemokines the degradation products retain inverse agonistic activity or direct antibacterial activity (50). The CCL20 degradation products formed in vitro by Cath-D and Cath-B include several stable oligopeptides with 55 and 12 aa, and 66 aa, respectively. However, because no specific Abs to recognize these peptides are available, we could not identify CCL20 cleavage products in tissue. Furthermore, it is conceivable that the peptides are further processed by a combination of the proteases in vivo. Our data demonstrate that in malignant human melanoma Cath-D (and/or Cath-D-like proteases) and Cath-B are responsible for the processing of CCL20 in acidic conditions and that Cath-B alone is responsible for the cleavage of CCL20 in neutral conditions. We found that CCL20 is processed and functionally inactivated by Cath-D by cleaving off the last 12 aa, whereas removal of the last 4 aa at the C terminus by Cath-B does not affect its chemotactic potency. This latter finding is in agreement with previous reports showing that the C-terminally truncated isoform of CCL20 missing three residues is equipotent to full-length CCL20 in calcium mobilization assays (51), although in that study, no protease responsible for cleaving off C-terminal amino acids was identified. Our findings suggest that Cath-B may also be directly implicated in the posttranslational modification of CCL20 occurring in some cell populations, such as PBMC (51). Cath-D does not recognize a specific amino acid sequence, but, as observed with other proteases, it cleaves chemokines at different sites, indicating therefore that enzyme activity may be at least in part modulated by the tertiary structure of its substrates. Efficient cleavage of CCL20 by Cath-D was observed at pH 4.0. A pH <6.0 may be rarely found in the extracellular environment of healthy tissues, but it is well known that the microenvironment of a tumor is acidic (52). Multiple pathways contribute to an acidic microenvironment in tumors, including the finding that breast cancer cells and macrophages within cancerous tissue have a high potential to liberate protons into the extracellular milieu and that anoxia, a characteristic of many cancers, may also promote an acidic environment in tumors (7). Furthermore, Cath-B activity is pH dependent; this protease is an endopeptidase at neutral pH but changes to an exopeptidase below pH 5.5 (53). Hoover et al. (40) investigated the x-ray structure of the human CCL20 monomer. They found that amino acids W54 to L63 form the C-terminal α helix. The C-terminal helix interacts with the β-sheet through the side chains of 10 residues including W55, V56, I59, V60, and L63, creating a hydrophobic core spanning the secondary structure elements. Lack of interpretable electron density indicates that the five C-terminal residues, K66–M70, are disordered. Our results concerning the loss of CCL20 activity by processing between residues W55–V56, and the unchanged chemotactic potency of CCL20 after cleavage between residues K66–V67 are therefore in agreement with these structural data. Secreted chemokines generate a chemotactic gradient in vivo through immobilization to GAGs of the extracellular matrix. GAGs binding may potentiate the chemotactic activity of chemokines by increasing local concentrations, by promoting oligomerization processes, by protecting chemokines from proteolytic attack (54, 55), and by facilitating their presentation to high-affinity receptors (56, 57, 58). The binding between GAGs and chemokines is due to electrostatic interactions between sulfated groups of the GAG and cationic charges localized on the C terminus of the chemokines, such as are present in CCL20. 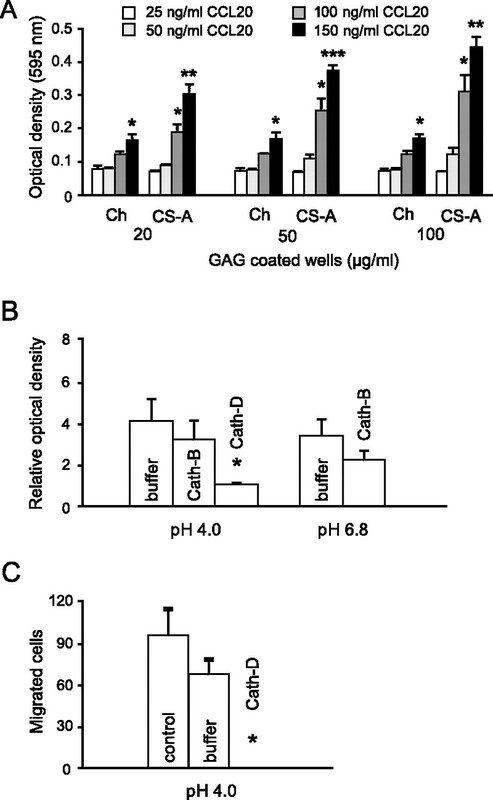 Our data demonstrating that Cath-D retain their full proteolytic activity on GAG-bound CCL20 strongly suggest that this degradation processes may indeed occur in vivo. CCL20 contributes to the adaptive immune response by recruiting CCR6 expressing immature dendritic cells to the site of inflammation. The finding that epithelial cells and in particular keratinocytes are good producers of CCL20 as well as the recently described bactericidal properties of CCL20 (5, 40) strongly suggest that this chemokine may have important defensive functions at barriers between the inner and outer milieu, such as the skin and the intestinal mucosa. Interestingly, we demonstrate that, although CCL20 lost its chemotactic potencies after Cath-D cleavage, the 12-aa peptide generated possessed antimicrobial activities. We found that the antibacterial activity of CCL2059–70 is similar to the antibacterial activity of the defensin hBD1 as obtained by Hoover et al. (40) using E. coli as a read-out system. Here, we demonstrate also that malignant melanocytes produce significant amounts of CCL20 and that CCL20 release may be stimulated in these cells by proinflammatory cytokines. These findings are indicative for possible other CCL20 functions. In this context, we also demonstrated that certain malignant melanocytes retain Cath-D activity in their membranes and that they produce and release Cath-D, whereas Cath-B activity is predominantly associated with the membrane and cytosolic component of cells. Both cathepsins were found to process CCL20 at its C terminus. It seems reasonable to question the biological relevance of concurrent expression of cathepsins and their substrate by melanoma cells. We can exclude a role of CCL20 as factor for tumor proliferation, because no CCR6 was found on melanoma cells (data not shown). The model in Fig. 8⇓ proposes an autocrine regulatory loop where melanoma cells process CCL20 by Cath-D-dependent pathway. Because Cath-D in the extracellular milieu may hamper the recruitment of immature dendritic cells through CCR6, antitumoral immune responses in melanoma need to be generated in a CCL20-independent way. Model of CCL20 regulation by cathepsin proteolysis. Melanoma cells produce functional CCL20 forming a haptotactic gradient by binding to GAGs of the extracellular matrix proteins. Dendritic cells migrate into tumors and, after taking up Ags, recruit tumor-associated macrophages. Cath-D release by the neoplastic cells abrogate the biological activity of CCL20, possibly allowing the melanoma cells to escape antitumoral immune responses. A 12-aa peptide resulting from this processing maintains some antimicrobial activity. ECM, Extracellular matrix; iDC, immature dendritic cells. We thank Dr. B. Moser for the CCL20 cDNA, Dr. A. Kappeler for immunohistochemistry technique, and Dr. M. Heller for help with peptide analysis. We also thank Dr. T. Brunner for reviewing the manuscript and Dr. C. Mueller and Dr. M. Thelen for valuable comments. ↵1 This work was supported by grants from the Swiss National Science Foundation (Grant 3100-066804) and the Bernische Krebsliga. ↵3 Abbreviations used in this paper: MMP, matrix metalloprotease; Cath-D, cathepsin D; Cath-B, cathepsin B; Cath-H, cathepsin H; CS, chondroitin sulfate; GAG, glycosaminoglycan; EIA/RIA, enzyme immunoassay/radioimmunoassay; pAB, 4-aminobenzoic acid; AMC, 7-amino-4-methylcoumarin. Moser, B., M. Wolf, A. Walz, P. Loetscher. 2004. Chemokines: multiple levels of leukocyte migration control. Trends Immunol. 25: 75-84. Thelen, M.. 2001. Dancing to the tune of chemokines. Nat. Immunol. 2: 129-134. Balkwill, F.. 2004. Cancer and the chemokine network. Nat. Rev. Cancer 4: 540-550. Yang, D., Q. Chen, D. M. Hoover, P. Staley, K. D. Tucker, J. Lubkowski, J. J. Oppenheim. 2003. Many chemokines including CCL20/MIP-3α display antimicrobial activity. J. Leukocyte Biol. 74: 448-455. Delgado, M. B., I. Clark-Lewis, P. Loetscher, H. Langen, M. Thelen, M. Baggiolini, M. Wolf. 2001. Rapid inactivation of stromal cell-derived factor-1 by cathepsin G associated with lymphocytes. Eur. J. Immunol. 31: 699-707. Wolf, M., I. Clark-Lewis, C. Buri, H. Langen, M. Lis, L. Mazzucchelli. 2003. Cathepsin D specifically cleaves the chemokines macrophage inflammatory protein-1α, macrophage inflammatory protein-1β, and SLC that are expressed in human breast cancer. Am. J. Pathol. 162: 1183-1190. Nufer, O., M. Corbett, A. Walz. 1999. Amino-terminal processing of chemokine ENA-78 regulates biological activity. Biochemistry 38: 636-642. Padrines, M., M. Wolf, A. Walz, M. Baggiolini. 1994. Interleukin-8 processing by neutrophil elastase, cathepsin G and proteinase-3. FEBS Lett. 352: 231-235. Ohashi, K., M. Naruto, T. Nakaki, E. Sano. 2003. Identification of interleukin-8 converting enzyme as cathepsin L. Biochim. Biophys. Acta 1649: 30-39. Car, B. D., M. Baggiolini, A. Walz. 1991. Formation of neutrophil-activating peptide 2 from platelet-derived connective-tissue-activating peptide III by different tissue proteinases. Biochem. J. 275: 581-584. Balbin, M., A. Fueyo, A. M. Tester, A. M. Pendas, A. S. Pitiot, A. Astudillo, C. M. Overall, S. D. Shapiro, C. Lopez-Otin. 2003. Loss of collagenase-2 confers increased skin tumor susceptibility to male mice. Nat. Genet. 35: 252-257. McQuibban, G. A., G. S. Butler, J. H. Gong, L. Bendall, C. Power, I. Clark-Lewis, C. M. Overall. 2001. Matrix metalloproteinase activity inactivates the CXC chemokine stromal cell-derived factor-1. J. Biol. Chem. 276: 43503-43508. Zhang, K., G. A. McQuibban, C. Silva, G. S. Butler, J. B. Johnston, J. Holden, I. Clark-Lewis, C. M. Overall, C. Power. 2003. HIV-induced metalloproteinase processing of the chemokine stromal cell derived factor-1 causes neurodegeneration. Nat. Neurosci. 6: 1064-1071. McQuibban, G. A., J. H. Gong, E. M. Tam, C. A. McCulloch, I. Clark-Lewis, C. M. Overall. 2000. Inflammation dampened by gelatinase A cleavage of monocyte chemoattractant protein-3. Science 289: 1202-1206. Muller, A., B. Homey, H. Soto, N. Ge, D. Catron, M. E. Buchanan, T. McClanahan, E. Murphy, W. Yuan, S. N. Wagner, et al 2001. Involvement of chemokine receptors in breast cancer metastasis. Nature 410: 50-56. Westley, B. R., F. E. May. 1996. Cathepsin D and breast cancer. Eur. J. Cancer 32A: 15-24. Thorpe, S. M., H. Rochefort, M. Garcia, G. Freiss, I. J. Christensen, S. Khalaf, F. Paolucci, B. Pau, B. B. Rasmussen, C. Rose. 1989. Association between high concentrations of Mr 52,000 cathepsin D and poor prognosis in primary human breast cancer. Cancer Res. 49: 6008-6014. Otto, F. J., T. Goldmann, B. Biess, A. Lippold, L. Suter, U. Westhoff. 1999. Prognostic classification of malignant melanomas by combining clinical, histological, and immunohistochemical parameters. Oncology 56: 208-214. Hieshima, K., T. Imai, G. Opdenakker, J. Van Damme, J. Kusuda, H. Tei, Y. Sakaki, K. Takatsuki, R. Miura, O. Yoshie, H. Nomiyama. 1997. Molecular cloning of a novel human CC chemokine liver and activation-regulated chemokine (LARC) expressed in liver: chemotactic activity for lymphocytes and gene localization on chromosome 2. J. Biol. Chem. 272: 5846-5853. Charbonnier, A. S., N. Kohrgruber, E. Kriehuber, G. Stingl, A. Rot, D. Maurer. 1999. Macrophage inflammatory protein 3α is involved in the constitutive trafficking of epidermal Langerhans cells. J. Exp. Med. 190: 1755-1768. Tanaka, Y., T. Imai, M. Baba, I. Ishikawa, M. Uehira, H. Nomiyama, O. Yoshie. 1999. Selective expression of liver and activation-regulated chemokine (LARC) in intestinal epithelium in mice and humans. Eur. J. Immunol. 29: 633-642. Iwasaki, A., B. L. Kelsall. 2000. Localization of distinct Peyer’s patch dendritic cell subsets and their recruitment by chemokines macrophage inflammatory protein (MIP)-3α, MIP-3β, and secondary lymphoid organ chemokine. J. Exp. Med. 191: 1381-1394. Cook, D. N., D. M. Prosser, R. Forster, J. Zhang, N. A. Kuklin, S. J. Abbondanzo, X. D. Niu, S. C. Chen, D. J. Manfra, M. T. Wiekowski, et al 2000. CCR6 mediates dendritic cell localization, lymphocyte homeostasis, and immune responses in mucosal tissue. Immunity 12: 495-503. Power, C. A., D. J. Church, A. Meyer, S. Alouani, A. E. Proudfoot, I. Clark-Lewis, S. Sozzani, A. Mantovani, T. N. Wells. 1997. Cloning and characterization of a specific receptor for the novel CC chemokine MIP-3α from lung dendritic cells. J. Exp. Med. 186: 825-835. Liao, F., R. Alderson, J. Su, S. J. Ullrich, B. L. Kreider, J. M. Farber. 1997. STRL22 is a receptor for the CC chemokine MIP-3α. Biochem. Biophys. Res. Commun. 236: 212-217. Al-Aoukaty, A., B. Rolstad, A. Giaid, A. A. Maghazachi. 1998. MIP-3α, MIP-3β and fractalkine induce the locomotion and the mobilization of intracellular calcium, and activate the heterotrimeric G proteins in human natural killer cells. Immunology 95: 618-624. Campbell, J. J., J. Hedrick, A. Zlotnik, M. A. Siani, D. A. Thompson, E. C. Butcher. 1998. Chemokines and the arrest of lymphocytes rolling under flow conditions. Science 279: 381-384. Liao, F., R. L. Rabin, C. S. Smith, G. Sharma, T. B. Nutman, J. M. Farber. 1999. CC-chemokine receptor 6 is expressed on diverse memory subsets of T cells and determines responsiveness to macrophage inflammatory protein 3α. J. Immunol. 162: 186-194. Liao, F., A. K. Shirakawa, J. F. Foley, R. L. Rabin, J. M. Farber. 2002. Human B cells become highly responsive to macrophage-inflammatory protein-3α/CC chemokine ligand-20 after cellular activation without changes in CCR6 expression or ligand binding. J. Immunol. 168: 4871-4880. Rossi, D. L., A. P. Vicari, K. Franz-Bacon, T. K. McClanahan, A. Zlotnik. 1997. Identification through bioinformatics of two new macrophage proinflammatory human chemokines: MIP-3α and MIP-3β. J. Immunol. 158: 1033-1036. Kimura, T., H. Takeshima, N. Nomiyama, T. Nishi, T. Kino, M. Kochi, J. I. Kuratsu, Y. Ushio. 2002. Expression of lymphocyte-specific chemokines in human malignant glioma: essential role of LARC in cellular immunity of malignant glioma. Int. J. Oncol. 21: 707-715. Clark-Lewis, I., L. Vo, P. Owen, J. Anderson. 1997. Chemical synthesis, purification, and folding of C-X-C and C-C chemokines. Methods Enzymol. 287: 233-250. Loetscher, M., B. Gerber, P. Loetscher, S. A. Jones, L. Piali, I. Clark-Lewis, M. Baggiolini, B. Moser. 1996. Chemokine receptor specific for IP10 and mig: structure, function, and expression in activated T lymphocytes. J. Exp. Med. 184: 963-969.
von Tscharner, V., B. Prod’hom, M. Baggiolini, H. Reuter. 1986. Ion channels in human neutrophils activated by a rise in free cytosolic calcium concentration. Nature 324: 369-372. Heylen, N., L. M. Vincent, V. Devos, V. Dubois, C. Remacle, A. Trouet. 2002. Fibroblasts capture cathepsin D secreted by breast cancer cells: possible role in the regulation of the invasive process. Int. J. Oncol. 20: 761-767. Guo, M., P. A. Mathieu, B. Linebaugh, B. F. Sloane, J. J. Reiners, Jr. 2002. Phorbol ester activation of a proteolytic cascade capable of activating latent transforming growth factor-βL a process initiated by the exocytosis of cathepsin B. J. Biol. Chem. 277: 14829-14837. Hoover, D. M., C. Boulegue, D. Yang, J. J. Oppenheim, K. Tucker, W. Lu, J. Lubkowski. 2002. The structure of human macrophage inflammatory protein-3α/CCL20: linking antimicrobial and CC chemokine receptor-6-binding activities with human β-defensins. J. Biol. Chem. 277: 37647-37654. Schmuth, M., S. Neyer, C. Rainer, A. Grassegger, P. Fritsch, N. Romani, C. Heufler. 2002. Expression of the C-C chemokine MIP-3α/CCL20 in human epidermis with impaired permeability barrier function. Exp. Dermatol. 11: 135-142. Homey, B., H. Alenius, A. Muller, H. Soto, E. P. Bowman, W. Yuan, L. McEvoy, A. I. Lauerma, T. Assmann, E. Bunemann, et al 2002. CCL27-CCR10 interactions regulate T cell-mediated skin inflammation. Nat. Med. 8: 157-165. Kuschert, G. S., F. Coulin, C. A. Power, A. E. Proudfoot, R. E. Hubbard, A. J. Hoogewerf, T. N. Wells. 1999. Glycosaminoglycans interact selectively with chemokines and modulate receptor binding and cellular responses. Biochemistry 38: 12959-12968. Culley, F. J., E. J. Fadlon, A. Kirchem, T. J. Williams, P. J. Jose, J. E. Pease. 2003. Proteoglycans are potent modulators of the biological responses of eosinophils to chemokines. Eur. J. Immunol. 33: 1302-1310. Bruhl, H., C. D. Cohen, S. Linder, M. Kretzler, D. Schlondorff, M. Mack. 2003. Post-translational and cell type-specific regulation of CXCR4 expression by cytokines. Eur. J. Immunol. 33: 3028-3037. Lah, T. T., M. Cercek, A. Blejec, J. Kos, E. Gorodetsky, R. Somers, I. Daskal. 2000. Cathepsin B, a prognostic indicator in lymph node-negative breast carcinoma patients: comparison with cathepsin D, cathepsin L, and other clinical indicators. Clin. Cancer Res. 6: 578-584. Kos, J., B. Werle, T. Lah, N. Brunner. 2000. Cysteine proteinases and their inhibitors in extracellular fluids: markers for diagnosis and prognosis in cancer. Int. J. Biol. Markers 15: 84-89. Ehlert, J. E., F. Petersen, M. H. Kubbutat, J. Gerdes, H. D. Flad, E. Brandt. 1995. Limited and defined truncation at the C terminus enhances receptor binding and degranulation activity of the neutrophil-activating peptide 2 (NAP-2): comparison of native and recombinant NAP-2 variants. J. Biol. Chem. 270: 6338-6344. Ehlert, J. E., J. Gerdes, H. D. Flad, E. Brandt. 1998. Novel C-terminally truncated isoforms of the CXC chemokine β-thromboglobulin and their impact on neutrophil functions. J. Immunol. 161: 4975-4982. Hensbergen, P. J., D. Verzijl, C. I. Balog, R. Dijkman, R. C. van der Schors, E. M. van der Raaij-Helmer, M. J. van der Plas, R. Leurs, A. M. Deelder, M. J. Smit, C. P. Tensen. 2004. Furin is a chemokine-modifying enzyme: in vitro and in vivo processing of CXCL10 generates a C-terminally truncated chemokine retaining full activity. J. Biol. Chem. 279: 13402-13411. Schutyser, E., S. Struyf, P. Menten, J. P. Lenaerts, R. Conings, W. Put, A. Wuyts, P. Proost, J. Van Damme. 2000. Regulated production and molecular diversity of human liver and activation-regulated chemokine/macrophage inflammatory protein-3α from normal and transformed cells. J. Immunol. 165: 4470-4477. Tannock, I. F., D. Rotin. 1989. Acid pH in tumors and its potential for therapeutic exploitation. Cancer Res. 49: 4373-4384. Polgar, L., C. Csoma. 1987. Dissociation of ionizing groups in the binding cleft inversely controls the endo- and exopeptidase activities of cathepsin B. J. Biol. Chem. 262: 14448-14453. Sadir, R., A. Imberty, F. Baleux, H. Lortat-Jacob. 2004. Heparan sulfate/heparin oligosaccharides protect stromal cell-derived factor-1 (SDF-1)/CXCL12 against proteolysis induced by CD26/dipeptidyl peptidase IV. J. Biol. Chem. 279: 43854-43860. Webb, L. M., M. U. Ehrengruber, I. Clark-Lewis, M. Baggiolini, A. Rot. 1993. Binding to heparan sulfate or heparin enhances neutrophil responses to interleukin 8. Proc. Natl. Acad. Sci. USA 90: 7158-7162. Hoogewerf, A. J., G. S. Kuschert, A. E. Proudfoot, F. Borlat, I. Clark-Lewis, C. A. Power, T. N. Wells. 1997. Glycosaminoglycans mediate cell surface oligomerization of chemokines. Biochemistry 36: 13570-13578. Tanaka, Y., D. H. Adams, S. Hubscher, H. Hirano, U. Siebenlist, S. Shaw. 1993. T-cell adhesion induced by proteoglycan-immobilized cytokine MIP-1β. Nature 361: 79-82. Tanaka, Y., K. Kimata, A. Wake, S. Mine, I. Morimoto, N. Yamakawa, H. Habuchi, S. Ashikari, H. Yamamoto, K. Sakurai, et al 1996. Heparan sulfate proteoglycan on leukemic cells is primarily involved in integrin triggering and its mediated adhesion to endothelial cells. J. Exp. Med. 184: 1987-1997. Vol. 176 No. 11.